19.875x21.5x1 OdorBan Air Filters - Only $11.83 Each! 19.875" x 21.5" x 1"
Every 12 months Every 11 months Every 10 months Every 9 months Every 8 months Every 7 months Every 6 months Every 5 months Every 4 months Every 3 months Every 2 months Every 1 month No reminder ? This item is made to order, non-returnable, and ships within 1 business day. Please check the actual dimensions listed below prior to ordering. This is a non-standard size filter. The actual dimensions of the filter are 19.875" x 21.5" x 0.75". Please measure your existing filter before ordering to make sure it will be compatible. Utilizes gray carbon filter media to maximize surface area — 10,000 times more surface area than a traditional granulated carbon filter! What is a MERV rating? How often should I change my filter? How do I find the dimensions of my air filter? 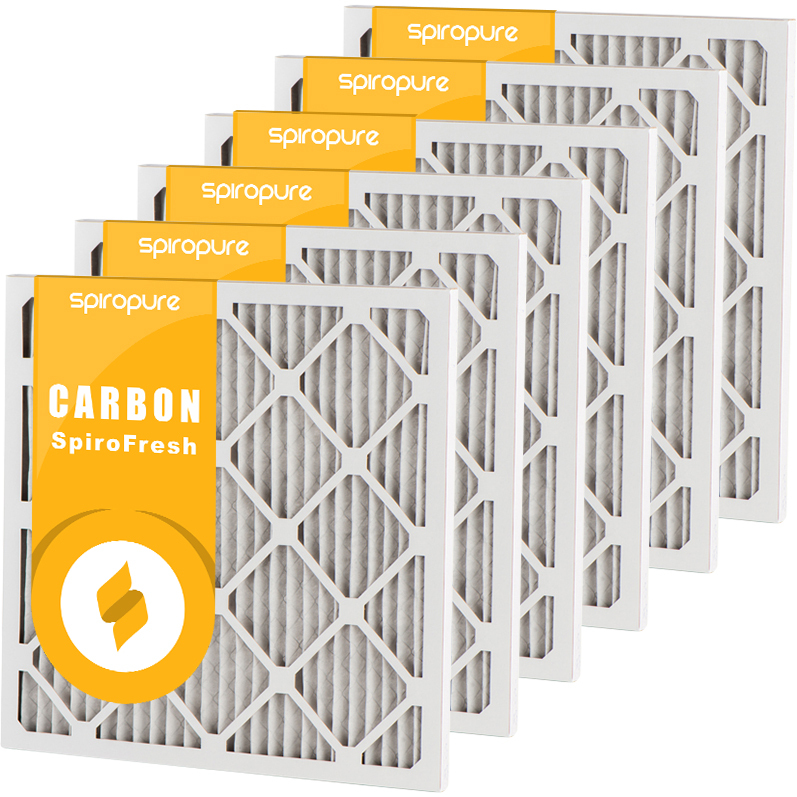 What is the benefit of using a carbon air filter? MERV stands for Minimum Efficiency Reporting Values and is an industry-created standard that evaluates the efficiency of air filters. The MERV rating of any particular air filter ranges on a scale of 1 to 16, with a filter rating 1 being the least efficient and a filter rating 16 being the most efficient. However, it is not always as simple as buying a filter with the highest MERV rating. Highly-rated MERV filters have very small pores, which creates more resistance against air flow that may put too much pressure on the fan in your unit. We recommend a MERV rating between 8 and 11 for most residential furnace and AC units to adequately remove airborne contaminants. Filters with a higher MERV rating must be replaced at least every three months to avoid restricted air flow and negative effects on your furnace’s performance. Actual replacement times will depend on a variety of household conditions, including running time on the furnace or air conditioning unit, the type of flooring in the house, and the presence of kids and/or pets. Generally, air filters should be replaced about every 2-3 months for optimal performance. Air filters use two sets of dimensions: actual and nominal. The actual dimensions are the exact height, length, and width measurements. Most filters are sold under nominal dimensions, which are rounded off to the nearest 1" measurement. For example, if your air filter measures 10 ½“ x 20 ¾” x 1¼”, the nominal dimensions will typically be 11” x 21“ x 1”. To find your filter size, we recommend measuring the actual dimensions of your existing filter and choosing the closest match in nominal dimensions. Filters should fit snugly without having to be forced into place. Forcing in a filter that is too large can cause tearing or buckling and results in a loss of efficiency. If you notice air leakage around the sides after installation, you may use gasket tape around the edges of the filter to create a tighter fit. The Odor Eliminator filter uses a carbon filter media to efficiently remove household odors without reducing air flow. Carbon media granules create more outer surface area for odors, fumes, and other contaminants to adhere to, and are resistant to moisture and microbial growth. The filter fits into existing filter housings to provide efficient, guaranteed odor control at a price that competes with standard pleated air filters! Full line of filters available, including Whirlpool, LG, Samsung, Kenmore, Frigidaire, and more! Full line of filters available, including Filbur, Hayward, Pentair, Pleatco, Unicel, and more! Relax in Purer, Healthier Water! Save BIG on Case Packs! The most advanced residential whole house water filter on the market! Available in many attractive styles and finishes to match the existing style of your bathroom! Get Softer Skin and Hair! *For orders shipping to addresses outside of the Contiguous U.S., customers will be responsible for shipping expenses totaling more than $20. Customer will be contacted if additional shipping costs apply. Purchase of this item qualifies you for free shipping! If your order contains this item, you automatically receive free shipping regardless of the order total (your order does not need to meet the minimum order total of $99). Copyright © 2019 All Filters LLC. All rights reserved.. The Email Reminder service allows you to receive automatic notification regarding your next filter replacement date. The default frequency for each filter will be the replacement frequency suggested by the manufacturer. You may opt out of the service or change the reminder date or frequency at any time. Simply click on the “Email Reminders“ link in the Services section at the bottom of any page on our site. If you are purchasing a new system, you will receive a reminder for the replacement filter for that system. For example, if you purchased a Culligan Pitcher Filter, you will receive a reminder for the Culligan Pitcher Filter Replacement Cartridge. If you do not wish to receive email reminders, please select the No reminder option in the drop down menu.